THE MINER'S DREAM OF HOME. Written and Composed by Will Goodwin and Leo Dryden. How I long to return to my own native land. The log was burning brightly-'twas a night that should banish all sin. 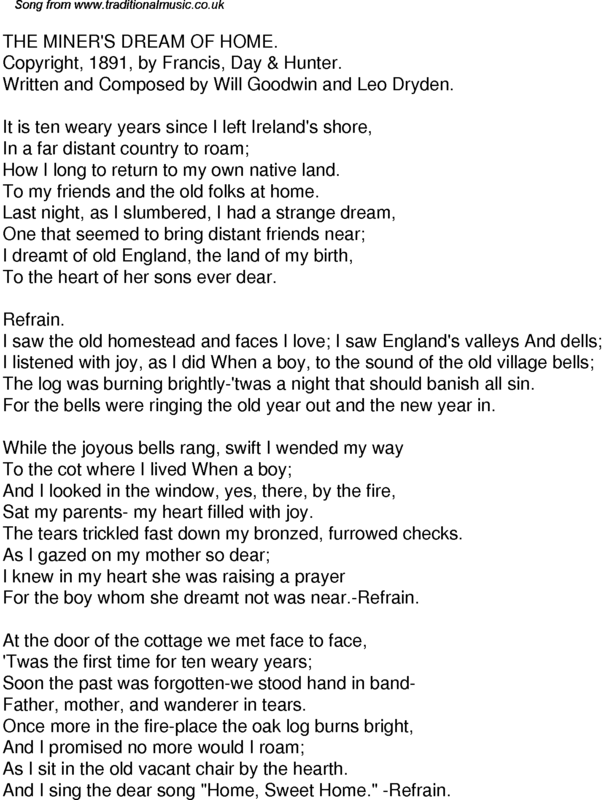 For the bells were ringing the old year out and the new year in. Sat my parents- my heart filled with joy. The tears trickled fast down my bronzed, furrowed checks. For the boy whom she dreamt not was near.-Refrain. Father, mother, and wanderer in tears. As I sit in the old vacant chair by the hearth. And I sing the dear song "Home, Sweet Home." -Refrain.